The Cacapon River, located in the Appalachian Mountains of West Virginia’s Eastern Panhandle region, is an 81-mile-long river known for its bountiful fishing, boating, wildlife, and scenery. As part of the Potomac River Watershed, it is an American Heritage River. 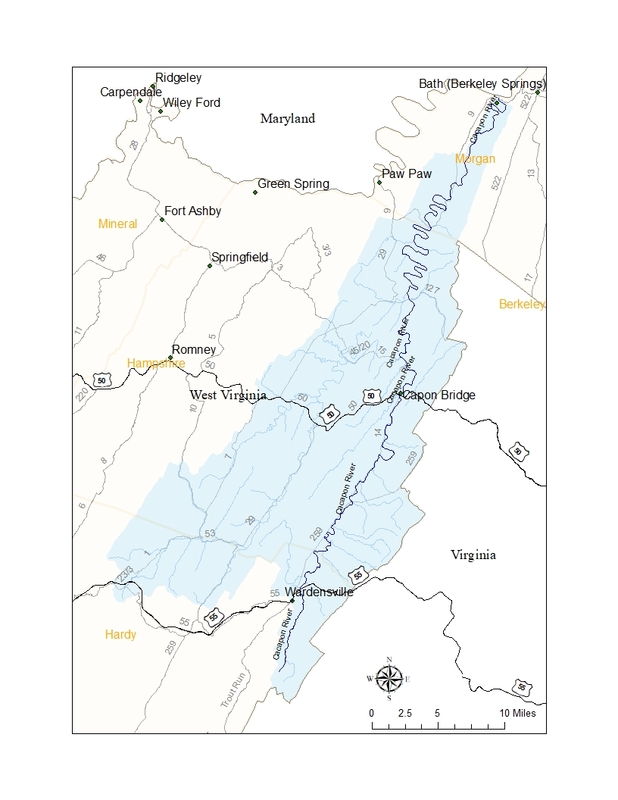 The Cacapon River Watershed is made up of three major river segments and many smaller stream watersheds. The headwaters of the Cacapon River, known as the Lost River, is 31.1 miles long and receives water from a watershed covering 178 square miles. The Lost and Cacapon Rivers are actually the same river. The two names arose because the Lost River flows underground in Hardy County and emerges a few miles downstream as the Cacapon River. The largest tributary of the Cacapon is the North River, which drains 206 square miles. The Cacapon Watershed is itself part of the Chesapeake Bay Watershed. The majority of the watershed is forested—approximately 70 to 80 percent is covered by trees, primarily a mix of coniferous and deciduous species. Diverse plant and animal life abound throughout the watershed. Weathered outcrops and boulder-strewn mountainsides of the Cacapon River basin offer clues to a geologic history hundreds of millions of years old. About 250 million years ago, Appalachia underwent its last phase of mountain building. Peaks were thrust 4 to 6 miles above sea level and then slowly eroded into the rounded mountains we see today. Some of the oldest rocks in the Cacapon basin are more than 500 million years old. These rocks are sedimentary: they are made of tiny grains of rock that collected in water and were then compressed together. The presence of these sedimentary rocks—and the occasional trilobite fossil—tell us that an ocean once covered the basin. Source: Cacapon Institute. 1993. Portrait of a River. No one knows exactly when humans first set foot in the Cacapon River basin. Most anthropologists believe we have been in Appalachia since the last Ice Age, about 12,000 years ago. A few even believe we were here 100,000 years ago. We do know that by the late 1600s, native human tribes populated the area and left their mark on the land. The next wave of human immigrants was from Europe. These European settlers arrived in the early 1700s. Seeking good soil and water, they followed the river valleys, erecting cabins in promising sites. They found themselves in one of the richest environment on Earth. Heavily forested mountains sheltered an array of wildlife; among them were buffalo, elk, and timber wolves. In less than 200 years, these and other species were gone, hunted to extinction or displaced by habitat change. By the 1920s, the thick forests were only a memory. With the railroad on its ways, virtually every major tract of the Appalachian forest was logged—cleared for agriculture or cut for fuel, turpentine, and ship masts. This deforestation had an impact on the Cacapon Watershed. Tons of soil eroded from mountain slopes. Silt muddied the water, destroying fish spawning areas and blocking sunlight from aquatic plants. The settlers not only removed organisms, they also introduced new species. A few, such as the chestnut blight fungus and the gypsy moths, have caused great damage; while others, like the rock bass and smallmouth bass, were non-threating.